AVAILABLE NOW IN BOTH BLACK AND WHITE IN LARGER SIZES. 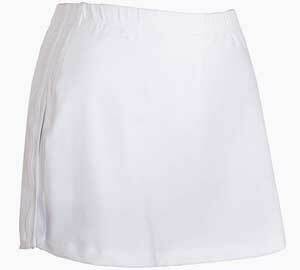 Plain black or white tennis skirt in the flattering Aida style with matching undershorts. Side slit on each side. Elasticated waist. We also have plain white or plain black tennis skirts in the Susanna and Sara styles. XXL length 17", waist (unstretched) 33"